Top selling set getting closer . . .
We know you’ve been waiting for us to get the super popular Super International set back in stock. Well, it’s almost here. And wait until you see it! Not only is there a cool new look to the box, but the cars have gotten a serious upgrade: 4 completely new cars on our fantastic new Mega-G chassis. 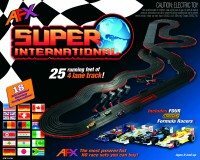 With 18 different layouts possible from just this one set, it’s easy to see why Super International has been our biggest seller year, after year, after year. And now, with Mega-G cars and 4 completely new liveries, it is an even bigger value than before. We are expecting them to be in our warehouse and at your local hobby shop in the second half of May. Look for them!